Over the centuries, millions of believers in Jesus Christ—including preachers and teachers, writers and reformers, missionaries and martyrs—have believed that Jesus Christ was crucified on Friday and rose early on Sunday morning. But because Jesus said he would be “three days and three nights in the heart of the earth” (Matt. 12:40), in comparatively recent times, another explanation emerged—that he was buried just before sundown on Wednesday. Then, figuring exactly three days and nights (72 hours) later, the resurrection would have occurred just before sundown on Saturday. On Sunday morning, he was already risen. The author, having held this position himself, upon reconsideration, came to see it is seriously flawed. It is not based on the total testimony of Scripture. 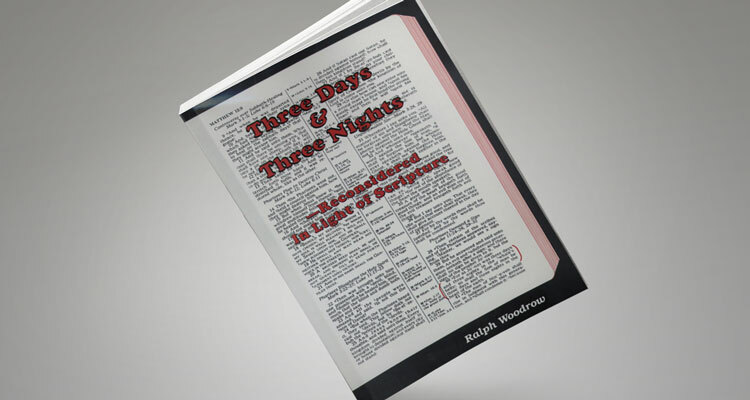 There is only ONE verse that uses the term “three days and three nights in the heart of the earth”! There are TWENTY verses that say Christ’s resurrection would be “in three days” or “the third day.” According to a basic rule of biblical interpretation, we would normally seek to understand one verse in the light of twenty, not the other way around. If we count days from an event that happened on Friday, the next day would be Saturday, and Sunday would be the third day—regardless of when the event happened on Friday. This is normal language, confirmed by numerous biblical examples. • Was a time period of three days and three nights the ONLY sign Jesus gave that he was the Messiah, as some claim? • When Jesus spoke of “the heart of the earth,” did he mean the tomb in which his body would be placed? • Were there two Sabbaths during the week Jesus was crucified? • Figuring that a day ends at sundown, how can we explain the wording “in the end of the sabbath, as it began to dawn...””? Ralph Woodrow Evangelistic Association, Inc.
Make a donation to support this ministry. Thank you in advance for your support.